And a great mouse catcher! 🙂 Mice can chew electrical wiring within a house and cause a major fire. Haha! I love what you did there! What a wonderful, eye-to-eye view you’ve offered. The expression on its face is so appealing — just delightful. A wonderful photo and I love how you’ve snaked your text. It’s a very beautiful snake!😊 I had a corn snake for many years but now I only meet wild snakes to take shoots of them. Our European grass snake is also beautiful, black with yellow or white marks on the head. I have shoot many of them, but they are so shy so you must catch them and hold them for a while so they get almost tame. Too many people despise them! There are a lot of really beautiful, harmless species (and the poisonous ones leave you alone if you respect them with just a little distance). 🙂 People are far more dangerous, from what i have seen in life. Knowing you are right, what’s the remedy? We have soe deadly ones here, but if yu give respect they keep to themselves. Exactly, Paul! 🙂 Give them a little space and respect and no problem! People are way more dangerous, from what i have seen in life! Yes, I agree Tom, we are the dangerous ones. Cool shape poem & photo! When I hold snakes I’m always impressed by their muscles. You can feel their power. Yes, i love to hold them too! 🙂 They are wonderful creatures really, and too many have been miseducated to despise them. Though indeed I dislike them very much, (and never saw them beautiful) I loved your work of art Tom 🙂 Very nice! May be, but they are dangerous, and I live alone. They are really not that dangerous. People are dangerous! Delightful shaping of the verse. Nope, never saw one and years ago my parents rented a cottage in Alpena, Michigan. My father saw a snake and chopped its head off with an axe then came in to tell my mom and I about how he made it safe for us to go outside the cottage. We didn’t ask questions, what type of snake, how big, etc. but I’ve never seen a snake at all. I hope I never see one while hiking around in the bushes … I would be scared of its bite. I am more scared of creepy crawlies … I’m afraid they will run up my legs or land on me. 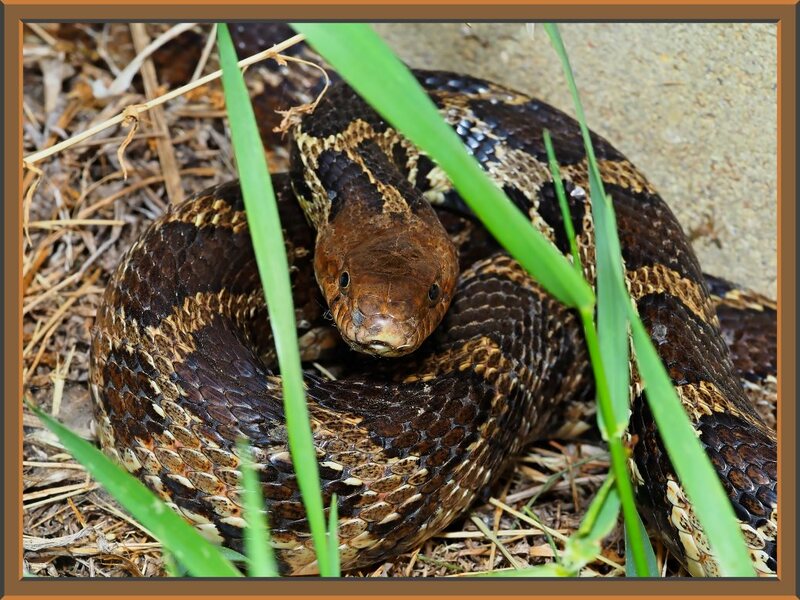 Michigan doesn’t have any poisonous snakes, except the Massassaga which is a pygmy snake that so endangered that it is protected by Federal Law. Great haiku and photograph! I always appreciate snakes in my garden! We do too! 🙂 They eat mice, which — if they get in your house — can chew the electrical wiring within walls and burn your house down! I enjoy the bull snakes, garter snakes and others. I don’t even mind the rattlers, unless they decide to move in!